To enrich your beer use as a direct replacement for household sugar. Using spraymalt improves the quality of any beer kit when used in place of sugar. It will brew beers which are less 'dry' with more richness, body and improved head formation and retention. 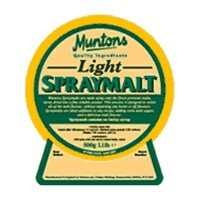 Light spraymalt is especially useful when brewing lighter beers such as lagers and pilsners. Great for priming.Make sure you replace your kit yeast with a Muntons Gold Yeast HB4U/4242.